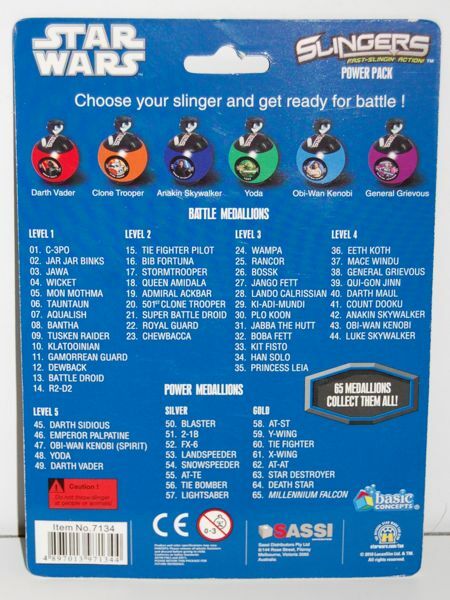 This is a game that you play with a “slinger” (a mechanized yoyo with a magnet on the bottom) and a number of metal medallions with various Star Wars characters on them. 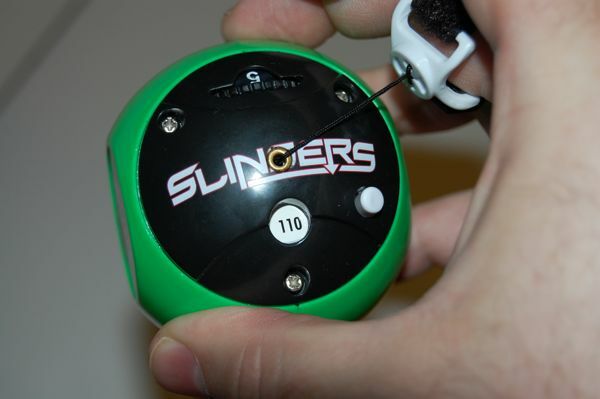 The object is to use the slinger to defeat the other players’ medallions before losing all of your lives. I don’t really have the patience to learn all of the rules, since it’s not as if I’m really going to be playing this, but the basic idea is that two or more players duel it out, with the medallions that you pick up determining how well you do. 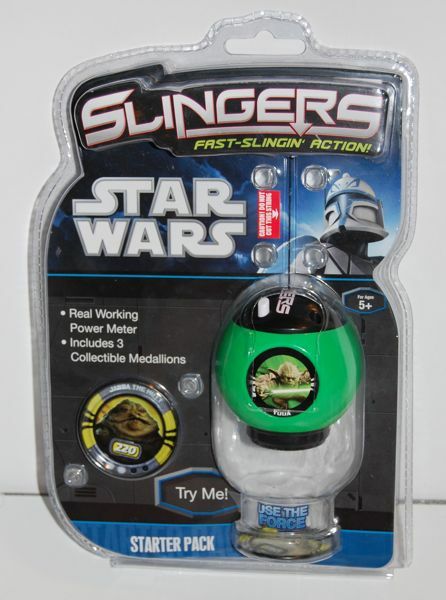 There are six kinds of slingers (each corresponding to the prequel versions of Darth Vader, Obi-wan Kenobi, Anakin, Clone Trooper, General Grievous, and Yoda). Each one has a couple of dials that are used to keep track of the player’s life and score, and supposedly they have different “Power” and “Stamina” ratings as well, although I don’t really understand what that means. A PDF of the instructions is below if you want to know more about the rules. Apparently there is a “battle mat” as well, although I guess it can be played without it. The “Starter Pack” comes with one slinger and three medallions. 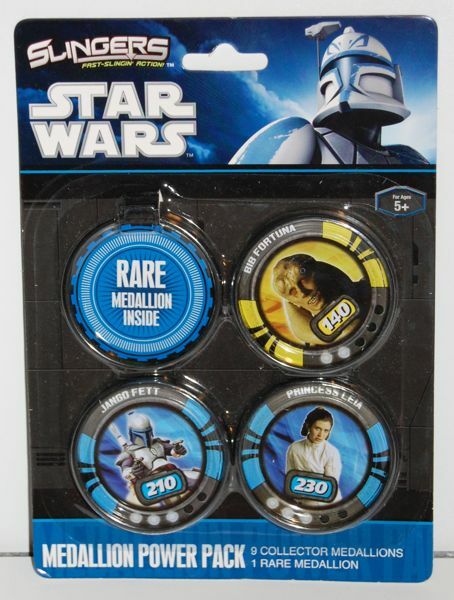 The “Medallion Power Pack” comes with 10 medallions (3 of which you can see in the package). Apparently there is also a “Booster Pack” of 5 medallions as well. The medallions seem to be randomly packed, and like POGS and collectible card games, a big part of the game is assembling your “deck” by buying medallions and trading friends for the particular ones you want. Since each player apparently needs a minimum of 20 medallions to play, you can see how this could get a little expensive. Here’s a list of all 65 medallions from the back of the Power Pack’s packaging. My friend who got these for me was able to select packs with some Jabba-related characters showing, and I got a Gamorrean Guard in the Power Pack as well, so all I’m missing from Jabba’s palace is the Rancor. I think the game itself looks kind of silly, but the medallions are actually pretty nice. I imagine they’re made out of steel, since they obviously have to be magnetic. While they’re fairly thin, they have a bit of weight to them and don’t feel flimsy at all. They’re 2 inches in diameter. It looks like the character photos are actually painted on the metal — it’s not just a sticker or anything. As I said, a friend in Australia got it for me. I haven’t seen the Star Wars version in the US, but I did recently see one using Marvel characters at Toys R Us, so I would be surprised if the Star Wars ones don’t make it here eventually. 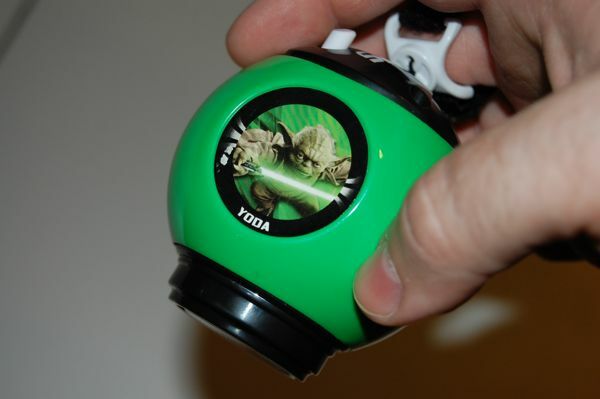 ohhhh, can you buy for me the star wars yoyo ………….